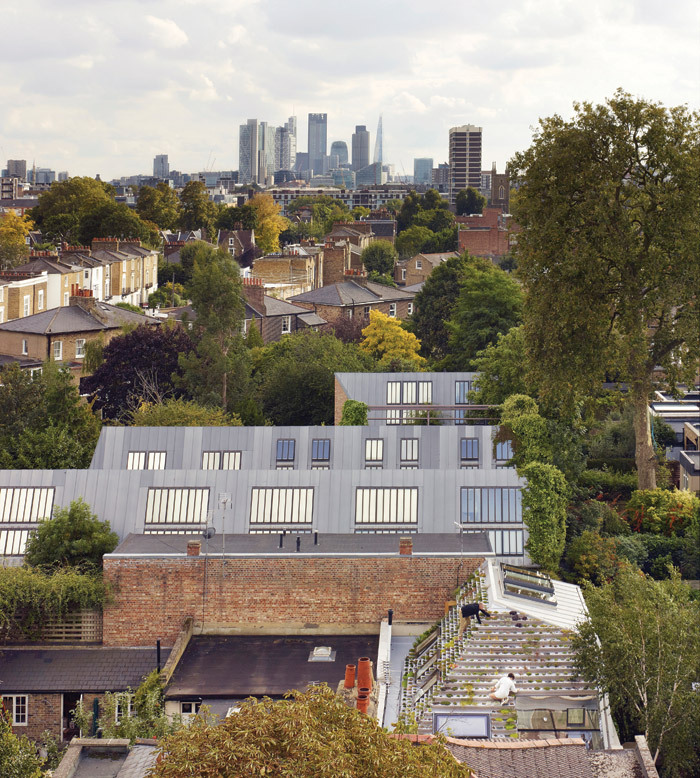 Shoe-horned into a tight, hemmed-in site hidden behind the uniform rows of Victorian terraces in Hackney’s de Beauvoir conservation area, Garden House is a compact, two-storey live/ work space that maximises every scrap of space and light it has access to. 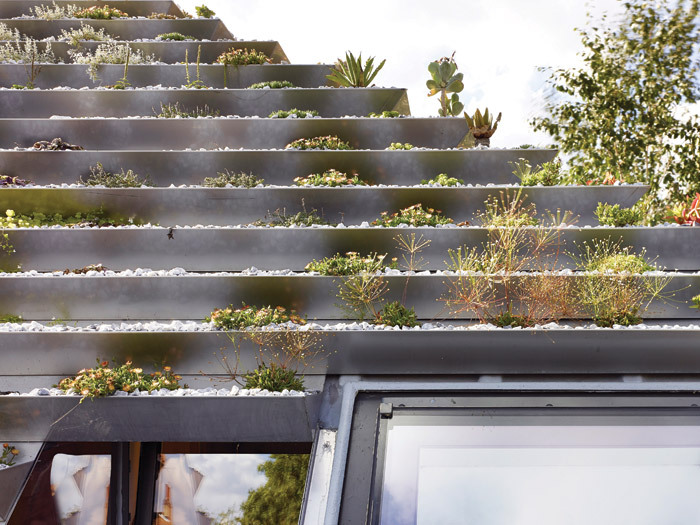 Once the back garden of a three-storey, early Victorian villa, now the plot is topped with a very different kind of urban garden - a shiny, stepped ziggurat roofscape, or ‘hanging basket’ as its architect, practice Hayhurst and Co, likes to call it, that can be climbed to tend the many plants that sprawl across its surface. It’s a jewel-like form befitting its owners, designer-makers Patrick Whitaker and Keir Malem (aka Whitaker Malem), who create exquisitely crafted and moulded leatherwork for the likes of fashion designers Hussein Chalayan and Alexander McQueen, as well as for films such as Wonder Woman and Batman. 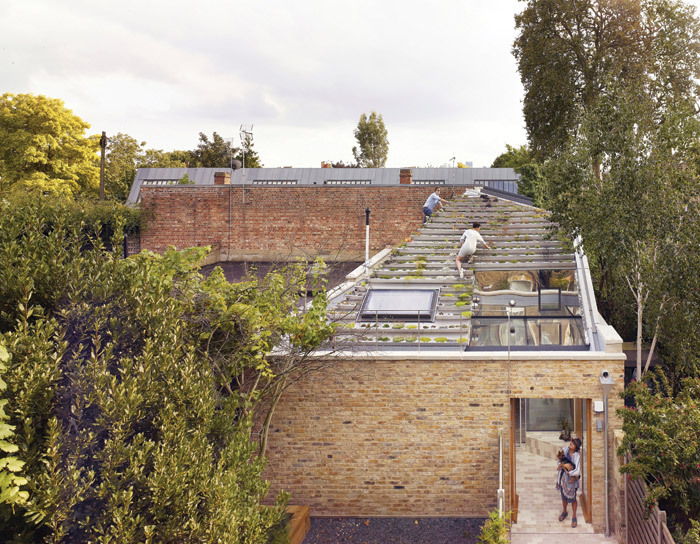 Previously used by a blacksmith and then as a photographer’s studio, the original single-storey garden workshop was bought by Whitaker Malem in the mid-1990s, before transforming it themselves into a habitable live/work studio on a modest budget of £5,000. Twenty years later and it became clear that the rundown unit, a nondescript affair with a flat bitumen roof and polycarbonate skylights, was in need of an overhaul. 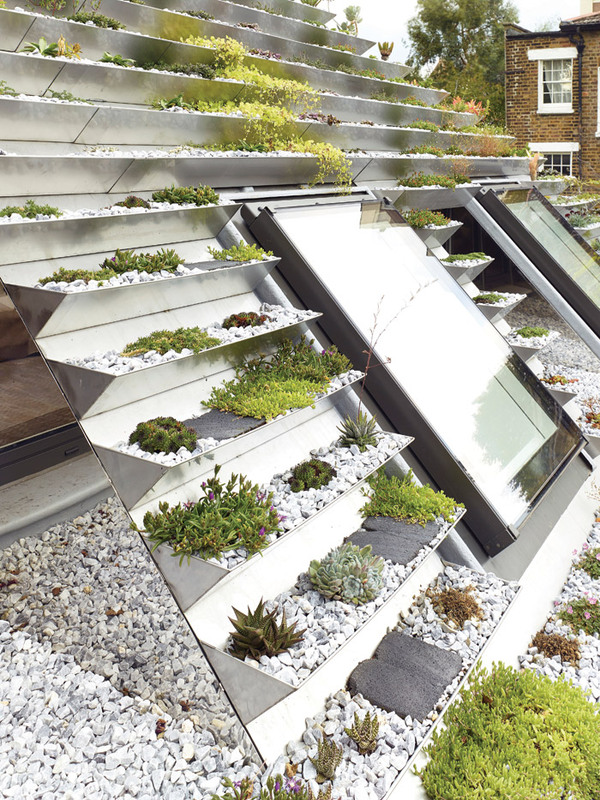 The resulting roof comprises marine-grade, stainless-steel planting trays that provide shallow, level beds for some 800 sedum, succulents and alpine plants, each hand-planted by the client. 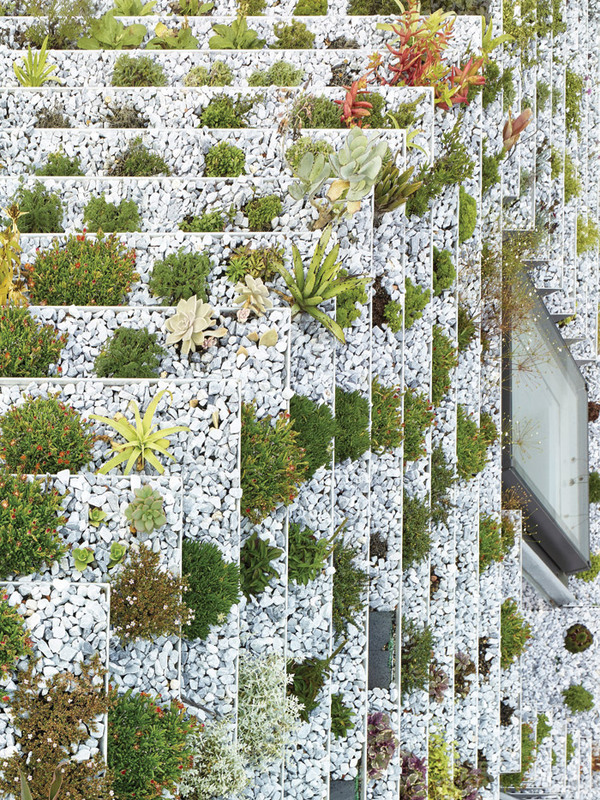 A 1:1 prototype was used during the design stage to test the drainage, fixing method and even which plant species would thrive on the soil substrate. The trays are secured to a ribbed GRP roof and incorporate a ribbed geotextile fleece to aid drainage that dissipates through perforations at the back of the trays. 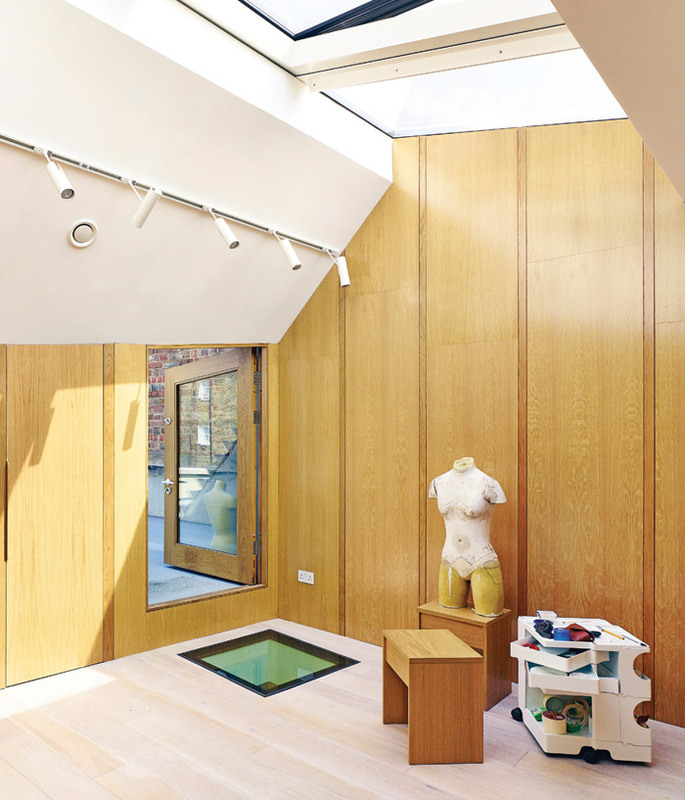 Skylights puncture the roof and funnel light deep into the ground floor, while mirrored stainless steel has been folded around the first-floor casement windows to draw in as much light as possible. Inside, the first-floor studio is all angles and lined with dark oak panelling to provide a rich, warm working environment. Built-in storage seamlessly fits into the walls, while desks beneath the casement windows provide a light work surface for sewing machines and embroidery work. The top-lit space is flexible enough to be used as a fitting room for clients and as a gallery space for private exhibitions. 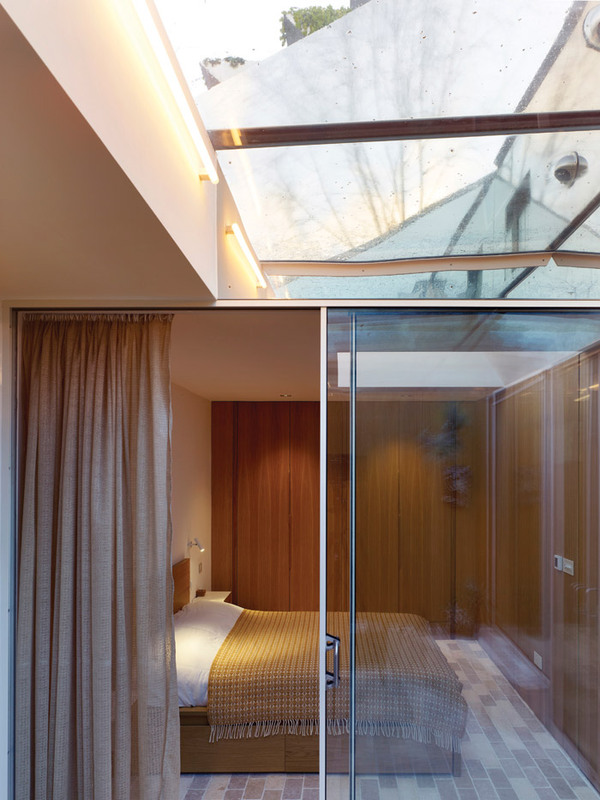 There’s also a compact en-suite shower room, should the top room ever be used as a guest bedroom. Downstairs the space is kept bright with white walls and pale, brick-shaped floor tiles. Hayhurst and Co has done remarkably well to make this boxed-in space feel light and airy without eating too much into usable practical space in the floor above. Despite having a small floor plan, it feels spacious where it could have felt bunker-like. The ground floor is open plan, with a separate bedroom at the front and a bathroom hidden away at the back. Bespoke, white steel shelves wrap around the space and provide a surface for Whitaker Malem’s art collection, while a minimal, cantilevered steel staircase floats away from the wall, maximising the amount of natural light that can pass behind it into the space. Says Nicholls: ‘To break the rectangular plan we introduced angles to the stairs and shelving. 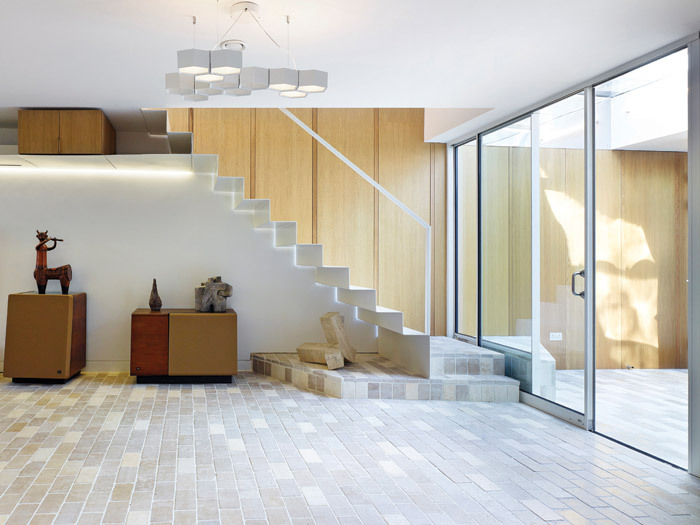 It was a playful thing to make the space more interesting, but also to create this generous open space without making the staircase feel too narrow.’ Opposite the staircase, a custom-made oak kitchen with moulded handles gives the space a mid-century feel. ‘We don’t do crisp minimalism, we like to use texture,’ explains Nicholls.